Syria has condemned as “a continuation of the campaign of misleading and lies since the beginning of aggression on it” the statement issued by the spiteful colonial western countries. 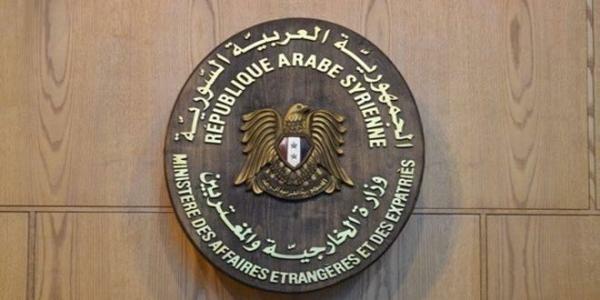 A source at Foreign and Expatriates Ministry said Thursday that it has become known to all that the US and its tools are the ones who have impeded any impartial and objective investigation in the allegations of the possible use of chemical weapon in Syria. “ Such investigation unveils their lies, fabrications and involvement along with the terrorist groups in using this weapon to accuse the Syrian State, “ the source added. The source stressed that those countries have constituted the main supporters for the aggression on Syria through providing all types of political, military, financial and logistic support to it. The chemical substances which were found in the terrorists’ hotbeds in Eastern Ghouta uncovered the goals of the hysteric campaign led by the hostile countries to protect the terrorist groups and conceal their full partnership with terrorism, the source elaborated. The source concluded by affirming that the Syrian people and their brave armed forces are determined to completely eradicate terrorism and maintain Syria’s sovereignty, unity and territorial integrity.